One of the biggest challenges business owners and executives face is time – there’s never enough to get it all done. We understand that researching the ins and outs of music licensing is very time-consuming (and quite confusing). 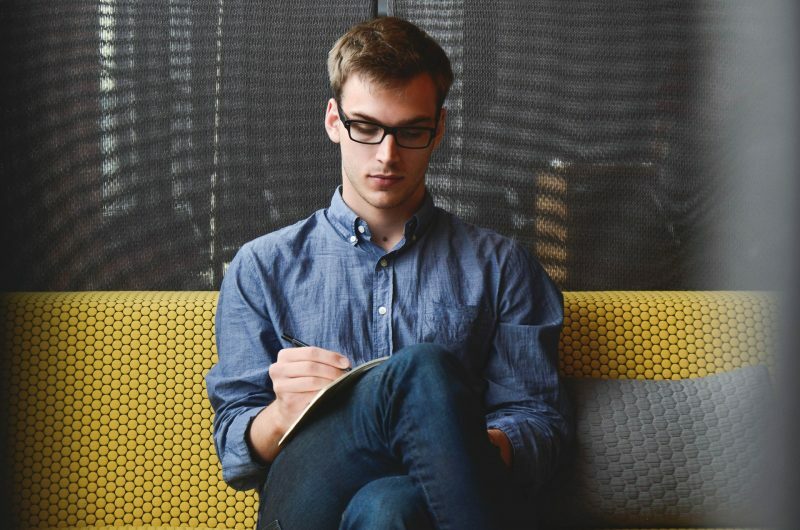 You're wondering, "How can I play music in my business legally?" That’s why we took the time to answer some of the most common questions business owners ask about legally playing music in your business. Can I legally stream Spotify, Apple Music, Tidal, SiriusXM or Pandora playlists as background music in my business establishment? Is it legal to play purchased iTunes music on my iPod/iPad/iPhone, CDs, MP3s or digital files for background music? How can I get the licenses for playing music in a business? If my business is licensed with one performing rights organization, do I still need to get licensed with the others? Are there any exceptions where I don’t have to pay business music licensing fees to the PROs? What happens if I stream music in my store without paying for licenses? What's the most cost-effective legal music for my business? 1. Can I legally stream Spotify, Apple Music, Tidal, SiriusXM or Pandora playlists as background music in my business establishment? "Can I play Pandora in my business?" "Is it legal to play Spotify in a business?" "Can I play Apple Music in my business?" The simple answer is... no. In business terms, music streaming services come in two forms—B2C (Business to Consumer) and B2B (Business to Business). The core music streaming services offered by companies like Spotify, Apple Music, Tidal, SiriusXM and Pandora, are all B2C—built for consumers, not businesses. This means they are licensed for private, non-commercial use (perfect to use at home with your friends & family). You need a Public Performance License (PPL) to play music in public places, including your customers and employees. Don’t worry! In this article, we’ll teach you the easiest ways to obtain this commercial license to play music in public in a business. 2. Is it legal to play purchased iTunes music on my iPod/iPad/iPhone, CDs, MP3s or digital files for background music? It is common in our digital age to be confused as to whether we own our digital content. When you pay to download music or even movies for that matter, you are essentially purchasing a license; you are leasing the content. Furthermore, you may only play this music in a non-commercial setting. You can listen to the songs to yourself as much as you like, but it is illegal to play in public. Playing the downloaded music in your business, however, would violate copyright law because the act is now considered a public performance. Public performances require a Public Performance License (PPL) from performing rights organizations (PROs). 3. How can I get the licenses for playing music in a business? What are the BMI and ASCAP license fees? There are four main performing rights organizations that songwriters, composers, and publishers join in the US & Canada—ASCAP (American Society of Composers, Authors and Publishers), BMI (Broadcast Music, Inc.), GMR (Global Music Rights), and SOCAN (The Society of Composers, Authors and Music Publishers of Canada). You may have searched for answers to questions like these: Do I have to pay ASCAP license fees? Do I have to pay BMI license fees? 4. If my business is licensed with one performing rights organization, do I still need to get licensed with the others? If you're looking to play a wider variety of popular music in your business, we highly suggest licensing with all the PROs. A music license with a performing rights organization only allows you to perform copyrighted music represented by that organization. The music industry is quite complicated when it comes to licensing. Many songs often have multiple songwriters, composers, and publishers, each of which may belong to a different performing rights organization. Since the creators and owners of the songs are represented by different PROs, assuring that the music you choose to play in your business is legal can get tricky! This why we recommend playing it safe by getting blanket licenses that cover all the PROs. 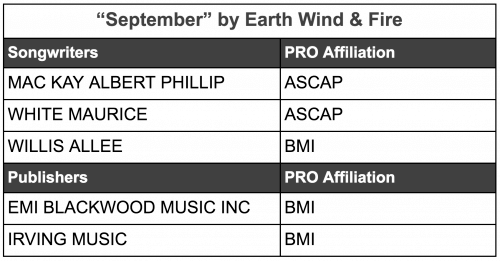 For example, check out the PRO licensing affiliations of Earth Wind & Fire’s “September”. “September” has songwriters and publishers represented by both ASCAP and BMI. More recently, pop and hip hop songs are increasing in the number of credited songwriters. There can commonly be over ten different songwriters, composers, and publishers! 5. Are there any exceptions where I don’t have to pay business music licensing fees to the PROs? If your business is broadcasting live music, karaoke, CDs, digital files, or DVDs, then you generally have to pay to use music in your business (unless you're covered under your music provider). There are a few exceptions, but please take note that the following exempt businesses cannot directly charge their customers to see or hear the music originating from the radio or TV, nor can the music be transmitted beyond the business establishment. They must also be sure that the music has been licensed by their respective copyright owners or PROs. Most importantly, the music coming from a radio station or TV channel must be broadcasted by the FCC (Federal Communications Commission). This limited selection can make it harder to control your music selection or music library. For more information, check out Section 110(5)(B). 6. What happens if I stream music in my store without paying for licenses? We are asked this sort of question all the time: Do I have to pay ASCAP? Do I have to pay BMI? To publicly perform copyrighted music in your business establishment, you are required to obtain permission from the copyright owner or representative (visit Copyright Law of the United States for details). Recently, for example, ASCAP filed 10 legal actions against bars and restaurants across the United States. While the average cost for these establishments to play music amounts to $2 a day, they refused to pay the fees owed to perform the copyrighted musical works of ASCAP's songwriter, composer, and music publisher members and were sued accordingly. The full list of businesses can be found here. Every year, BMI sues approximately half a dozen businesses in New Jersey alone for playing one of the songs in their repertoire of 8.5 million without a license. Amici III Ristorante didn’t have permission to play Rolling Stones' Brown Sugar, Elton John's Bennie and the Jets and Your Song, and Amy Winehouse's You Know I'm No Good, and the restaurant was thus fined $24,000 ($6,000 per song). Costs and resentment can quickly amount for businesses that are sued, so we highly recommend finding an economical, licensed music solution as soon as you can. 7. What's the most affordable legal music solution for my business? Music is vital to attracting customers and driving revenue, but we recognize the fact that most businesses work with a set (potentially limited) budget. Many companies turn to B2B music services for cost-effective and licensed music to stream at their business locations. Subscriptions for business music and retail radio solutions will generally range from $17 - $40/mo per location and these services for businesses will normally handle the music licensing paperwork on your behalf. Just to make sure you’re covered, we recommend asking your provider for letters of license verification. Cloud Cover Music is a legal business music streaming service starting from $17.95/mo with access to all of our music and features. Feel free to ask any more questions about legally streaming music in your business in the comments section below or via our Live Chat tool. We are here to help you learn everything you need to know to feel confident that you are legal to play music in your business.